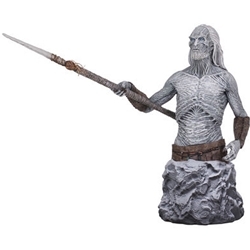 This Game of Thrones White Walker Bust features one of the White Walkers, or the Others, who are a fierce mythological race, seldom seen as they lurk and prey in their land in the frozen north of Westeros. The Wall was constructed ages ago to keep them isolated. They are evil, speaking in cracked tones and brandishing deadly icy weapons. This White Walker is a hand painted, numbered limited edition. Approximately 9 inches tall.